They Rule is a launchpad for investigating corporate power relationships in the United States. The website allows users to browse through a variety of maps that function as directories to companies such as Pepsi, Coca-Cola, and Microsoft. 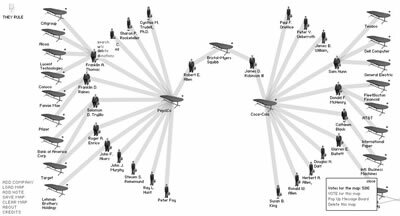 They Rule depicts the connections between companies through diagrams of their power structures, specifically their boards of directors. The minimalist symbolism of these diagrams--CEOs are represented as an iconic male or female holding a briefcase--highlights connections and gives the ruling power elite a kind of uniformity. The directors’ weight increases proportional to the number of boards they sit on. Users can run web searches on CEOs by clicking on their briefcase and accessing information about them, the donations they have made, or their companies. They can also add to a list of URLs relevant to that company or person or save a map of connections, complete with annotations, for others to view. Through mergers and takeovers, fewer and fewer companies control more and more of the economy, and these mega-corporations exert control in nearly every sector of it. As a many-to-many broadcasting system and vast information resource, the Internet is a perfect medium for making visible the intricate web of relationships between these corporate entities. They Rule employs the features of networked technologies, such as dynamic mapping, hyperlinking, and instant searches, to create its own subnetworks of power systems. On’s piece invokes C. Wright Mills’ book The Power Elite (1956), which documented the interconnections among the most powerful people in the US at that time. They Rule utilizes the Internet’s potential for access and transparency of data to create a qualitative description of these relationships. At a moment when growing e-commerce turns us into transparent customers, They Rule subverts the use of the Web as a mere marketing tool and invokes its original promise as a democratizing medium.